Christmas shopping – who needs it? The massive crowds, the Christmas carols on repeat, the compulsive buying of stuff that the giver probablycan’t afford and the recipient probably does not want. Hellish. So you may well ask what on earth possessed me to grab my handbag and head for Westfield Stratford City on the first Saturday last December, arguably the busiest day in Europe’s largest urban shopping centre. Unsurprisingly, the answer involved food: I was on my way to visit the newest branch of The Real Greek, a small chain of Greek restaurants in London that was founded in 1999 by Theodore Kyriakou and now comprises seven branches. Just the five minutes spent scrumming through the crowds from the station to the restaurant left me feeling fraught, frazzled and disproportionately thrilled at the offer of a glass of mulled wine upon arrival – and little did I know that this was just the start of the hospitality! The restaurant was buzzing and although more polished than you average Greek island taverna, nevertheless was decorated with beautiful Greek ceramics. Once I had located my dining companions Michelle, Sarah and Solange and was comfortably seated, I was introduced to the chain’s head of operations, Christos Karatzenis, a proud “real Greek” and former head chef at As Greek As it Gets. Christos practically grew up in his father’s restaurant back in Greece and hospitality is clearly in his bones – he was charming, knowledgeable and evidently keen for us to try as many dishes as possible from the rather extensive menu. “In Greece, we say that an empty table is a sin”, said Christos with a twinkle in his eye before proceeding to cleanse our sins (so to speak!) with a bottle of Mavrodaphne of Patras. Like many if my readers, the mention of the words “Greek wine” does not usually instil confidence, with bad memories of cheap retsina surfacing like indigestion – but this was an entirely different beast. Mavrodaphne is an indigenous Greek grape first made into the eponymous fortified wine in the 1850s by an enterprising Bavarian winemaker. Its initital vinification takes place in large oak vats exposed to the sun, before being mixed with distilled alcohol made from previous vintages to fortify it. It is then transferred to underground cellars to complete its maturation and is blended with portions of older vintages using the solera method – the same method used to make Jerez. The Mavrodaphne name is a Protected Designation of Origin according to EU law, and the finished product is a fantastic amber-coloured desert wine (15% alcohol) similar to the French Pineau and packed with Christmassy flavours of prunes, caramel and sultanas. I was already having a Shirley Valentine-style Greek love affair, and I’d only been there 10 minutes! The menu, as I said, is extensive and is divided into hot & cold meze; souvlaki; sharing platters; and desserts, as well as having a kids’ menu (which happily comprises skewers and meze rather than generic kiddie food – a burger being the only concession to non-Greek food). As we were sharing plates and trying as many things as possible, we concentrated only on the meze and desserts – here’s how it went down. We started with Kalamata olives (£2.50), excellent hot, pillowy Greek flat bread with olive oil ad dukkah(£2.50) that tasted like the fantastic breads I enjoyed in Corfu (and nothing at all like the travesty sold as pita in most supermarkets! ); and a bowl of vegetable crudites (£2.25) for the avalanche of dips that was to follow. Our selection of dips started with hummus (£4.25), which they evidently make from special Greek chickpeas to a recipe that includes less tahini than most of us are used to, giving the hummus a slightly grainer texture and more of chickpea flavour. I loved this, not being a fan of overly gloopy hummus. The tzatziki (£4.25) was perfectly correct – creamy yoghurt and cooling strands of cucumber. The taramasalata (£4.25) was as I rememebred it on Corfu – surprisingly colourless for those of us who have grown up on the pastel pink supermarket version (which is dyed). It also had a fairly thick texture and a properly fishy rather than an overly salty flavour – very very moreish! But my favourite remains the htipiti (£4.50), a dip which I first experienced at The Real Greek on the Southbank many years ago and was instantly smitten with. It is a combination of roasted red pepper, red onions and feta cheese – apparently every mother in Greece has their own recipe with some preferring spicy and others going for a milder version. The Real Greek serves a crowd-pleasing mild version and I could happily eat just that and their pita bread for lunch every day. But of course there is more to cold meze than just dips. 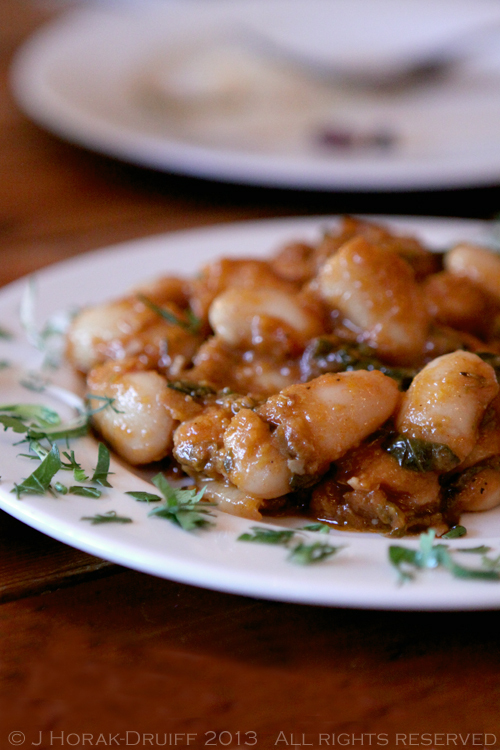 Next up we tried the gigandas plaki or “giant beans” , slow cooked in a tomato and herb sauce (£4.25). Being a lover of legumes, I enjoyed these – the texture of the beans was perfect: not too floury on the inside, and not too chewy on the outside, and full of the flavour of the sauce. No visit to a Greek restaurant would be complete without a plate of dolmades (£4.25) – and I rather liked these ones, stuffed with rice, herbs, pine nuts and sultanas. Sometimes, dolmades can be a bit bland, but the crunch of the pine nuts and the sweetness of the sultanas certainly ensured that these were cut above the rest. Our final cold meze was the satisfying beetroot, homemade feta and lentil salad (£4.50) which could easily be a meal in itself. 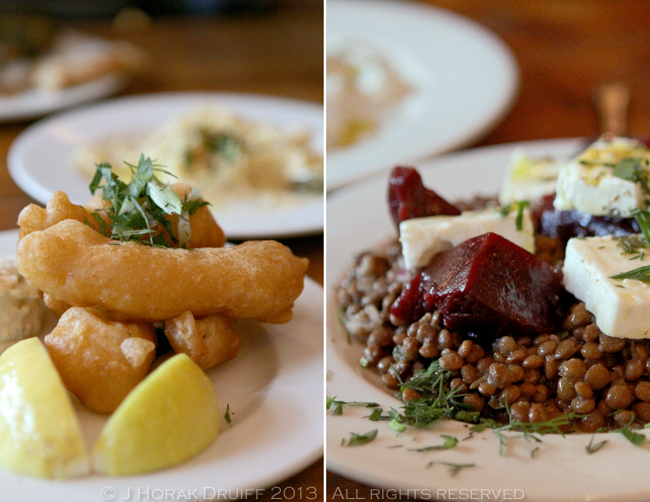 The interplay of flavours and textures was wonderful, and the feta was deliciously creamy – a winner of a dish. From there, we moved on to the warm meze. The southern European countries all have their own version of a salt cod dish, and Greece is no exception: salt cod fritters (£6.25) arrived as feather-light battered chunks of fish, soaked for 3 days prior to cooking to remove any overt saltiness. They were served with a lemony mayonnaise (presumably also homemade) which was fantastic. One of the hits of the afternoon was tiropitakia (£4.75) – filo pastry parcels stuffed with leek, feta cheese and spinach. They were not at all greasy, and the filling was both generous and tasty – not something that can always be said for restaurant pastry parcels. I also loved the beautifully presented tiger prawns with garlic and chilli (£6.50), served in a covetable mini frying pan and redolent with garlic aromas. The prawns themselves were soft and juicy, and packed with the flavour of garlic and the subtle heat of chilli. Also on the seafood front, we had grilled octopus (£7.25), a dish which you will find in every seaside taverna in Greece. In this dish, the octopus tentacles are sliced, grilled with olive oil and served, so that you can still see the suckers. But don’t let this deter you – the meat is buttery soft and tender and the antithesis of any bad chewy octopus experiences you may have had in the past. Another ubiquitous Greek dish that we enjoyed was grilled kalamari (£6.50) (served in the more familiar rings, with no tentacles involved!). These were also deliciously tender – far more so than the battered and deep-fried versions often are. Although we were reaching capacity, it would have been churlish to refuse Christos’ offer to try the meat dishes as well, so in the interests of research (!) we persevered. Bifteki Greek burger patties (£5.75) (not pictured) were more like flattened meatballs, meaning that the inside stayed moist and juicy. They were properly seasoned too with a good meaty flavour, although you do need their accompanying minted yoghurt as they can be rather dry on their own. I preferred the Greek lamb meatballs (£6.00) topped with a slow-cooked tomato concasse, Greek yoghurt and chopped red onion – succulent and packed with flavour. Lamb kefte (£5.50) (minced lamb cooked on a skewer in Anatolian spices, served with with mint yoghurt) was another winner – juicy and tasty, and who can resist food on a stick? Staying with the stick food, we also tried the chicken skewers (£5.25) with onions, peppers and more of that moreish preserved lemon mayonnaise. Often, chicken skewers can be as dry as cardboard and unappetising, but these managed to remain succulent, juicy and delicious. But everybody’s meaty favourite was definitely the pork belly (£6.25). Unlike its usual posh pub food incarnation of a square of meat topped with crackling, this bellyis served Greek-style without crackling and with the meat sliced up souvlaki style and served with oregano and paprika. It was perfectly heavenly – moist, tender and perfumed with paprika. I would go back just for this dish (and of course a bowl of htipiti!). And of course, no Greek meal would be complete without a proper Greek salad (£4.25) – no lettuce! As every schoolboy knows, we have a second stomach reserved especially for sweet things, so despite having soldiered on through all the abovementioned dishes, we still managed to perk up at the mention of dessert. I am far more of a savoury person than sweet, so often, dessert is a more appealing idea on paper than in practice – but I could not find fault in the desserts here, none of which were too rich or too sweet. They were also served on a metal stower stand which somehow seemed to magnify even more their importance and deliciousness! We had fresh orange segments & pistachios served on Greek yoghurt (£4.00) ; baklava (£4.25) ; caramel and pecan cheesecake (£5.00) ; and my personal favourite of Greek yoghurt and preserved walnuts in honey syrup (£4.25). The richest of the desserts was the cheesecake (also the least Greek!) 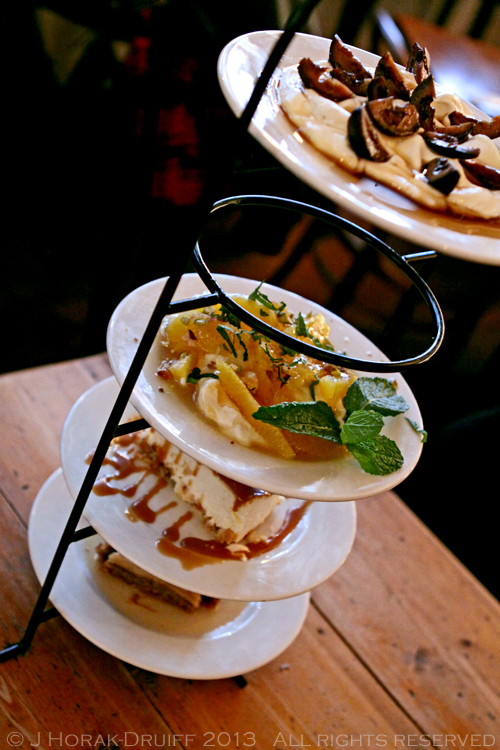 – I could detect little in the way of pecans or pecan flavour but oh my word, what a texture… Decadence on a plate. The baklava was perfect – light and flaky filo wrapped around dense, honeyed ground nuts – and in perfectly petit-four sized triangles as befits the richness of these pastries. 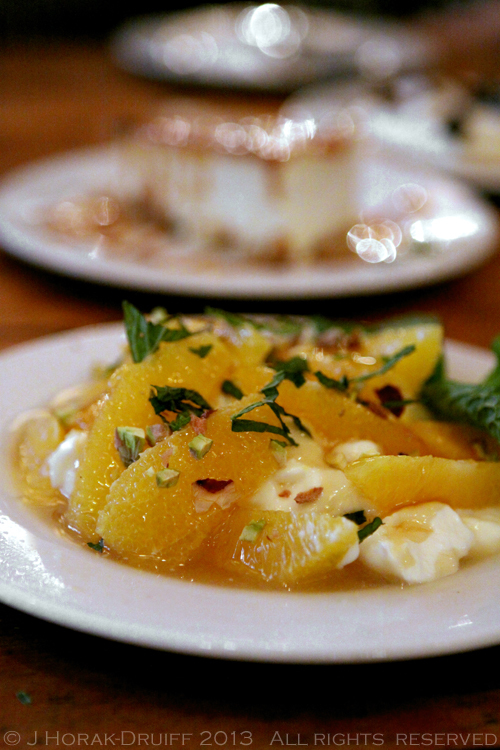 The fresh orange sefments came as a welcome light relief after both of these – a zesty palate cleanser. But oh those walnuts… At firstm we believed them to be chestnuts because of their yielding texture but walnuts they were – and what a fabulous idea. Why do we not eat more preserved walnuts? The balance of the creamy yoghurt, the yielding nuttiness of the walnuts and the sweetness of the honey syrup was sheer Greek perfection. Of course, no Greek meal woudl be complete without a cup of strong Greek coffee , which arrived in yet more covetable tableware: beautiful little brass coffee pots. DISCLOSURE: I enjoyed this meal as a guest of The Real Greek but received no remuneration other than the meal, and all opinions expressed are my own. Gosh that’s a lot of food you all got through! I think it’s somewhere I would enjoy, especially all the cold meze plates. I know – it felt like *quite* a lot at the time… but looking back at it objectively it was an obscene amount. Especially considering… I went out for dinner that evening too HAHAHA! That’s it I am going on a diet….before next review. Love the wine info. As I read this post, I realized it’s been way to long since I had Greek food. Your decription and pictures are absolutely mouthwatering (as usual! ): tzaziki? kefte? dolmades? Yes please! I love the food of The Real Greek (the salt cod being a particular fave) but find the service so slow – and I don’t mean cooking-food-to-order slow but front-of-house-being-in-a-dream-world slow. I used to go for lunch with work mates at the one by the Tate Modern and we had to stop going because the service as so slow we couldn’t fit it into our (extended!) lunch hour. That is a pity – it’s always silly for a restaurant to allow slow service to spoil what could have been a positive experience and drive away customers. That was a seriously good meal! I have bought some beetroot and feta this week to make that salad myself. I’m only sad that we’re rapidly exhausting our review options at Westfield!! What fantastic photos… ‘very acceptable’ 😉 certainly brings the food to mouth-watering life. This all looks soooo good. It’s always been my wife and I’s dream to open a taverna, as we love Greek food so much. It’s so underrated. This looks wonderful, and in Westfield, no less. Thanks for the heads up! Wow, you did quite a bit of research about the wine – I wished they gave me a bottle of the stuff. Excellent writing…as usual! I’m a research kinda girl 😉 That wine was the most pleasantly surprising part of the (excellent) meal!